Looking for an all-purpose art guide to Brooklyn? Look no further. Pernod Absinthe Superieure, creator of art history’s most inspirational spirit, has teamed up with WAGMAG, the Brooklyn art guide, to bring you mobile interaction with the thriving arts community of Brooklyn, NY. This newly improved app features WAGMAG’S unparalleled monthly gallery and events listings, as well as the best cocktail lounges in Brooklyn’s favorite party neighborhood, Williamsburg. The app features GPS mapping guiding you to the nearest art-and-drinks hot spots, and Facebook, Twitter, and Foursquare integration so you can know who is where and what’s happening — right now. 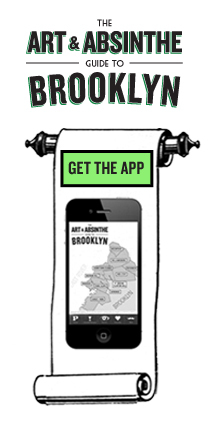 The Art & Absinthe Guide to Brooklyn has just been upgraded to offer an even better user experience, with easier navigation and more geo-location capabilities. For more information or to download the app for iPhone or Android visit artandabsinthebk.com.